Pound the garlic and 1/4 tsp salt into a paste, using a mortar and pestle. Add the basil, parsley and mint and continue to pound until the herbs break down and a thick paste is formed. Add half the pistachios and work them in well so the paste has a creamy texture. Roughly chop the remaining pistachios and stir through with the parmesan, 2 tbsp oil and lemon juice. Season with more salt if required and add a grind of pepper. Cook the linguine in boiling salted water for about 8 minutes, or until al dente. Drain well and place back in the pot with the lid on to keep warm. Heat a pan on a high heat with the remaining oil. Pan-fry the prawns for a minute each side, then season with remaining salt. 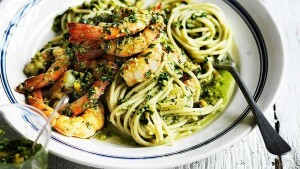 Mix the pesto and the prawns through the pasta and serve in four bowls.